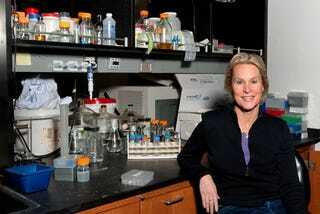 Frances Arnold designed a way to direct evolution-to take over the wheel from nature. In her lab at Caltech, she can essentially rewrite DNA then use it to change the way organisms behave, creating new proteins for renewable energy-"green" chemistry. Her methods revolutionized the field of protein engineering and are now used in hundreds of labs around the world. Arnold came up with her plan to override natural selection in the late 1980s, when she was a young, untenured chemical engineer at Caltech. Protein engineering was still in its infancy. Progress was slow, and she was impatient. Most of her colleagues were designing elegant, small-scale experiments to discover the rules underlying how DNA sequence and structure translate into proteins that carry out key functions-a noble endeavor but one that continues to elude the best scientific minds in the world. Arnold wanted to solve real-world problems, and she thought she could use nature's own method-evolution-to speed things up. "I thought, ‘Why on earth would you try to design something you don't understand?' " she recalls. "Evolution is the only molecular optimization method we know, so why not use it? Human beings have been manipulating the biological world for thousands of years without understanding how DNA codes function." If you want to understand this burgeoning field, you must read the rest of this article now. You'll be staring straight into the face of the future.